Today, the standards for assessing the different types of damages vary greatly from state to state. Tort reform nationally has had a significant impact on tort damages. In addition, many states have codified the law concerning claims for damages arising from medical malpractice, consumer rights, wrongful death, and products liability. 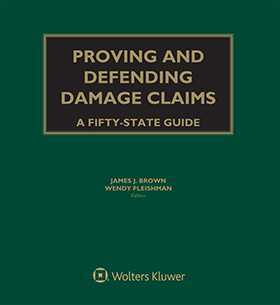 Proving and Defending Damage Claims: A Fifty-State Guide is the one reference that will help you accurately assess and pursue damages-- from drafting or defending a complaint to arguing damages at trial. Fifty-state surveys that provide quick and reliable answers to questions about recoverable damages. Analysis to help you calculate recoverable damages for particular causes of action. Reliable insights into the framework of punitive damages, including their availability and limitations.